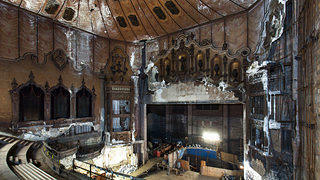 Brooklyn's Kings Theatre opened in 1929. After decades of neglect, it was restored and reopened in 2015 as a performing arts space. 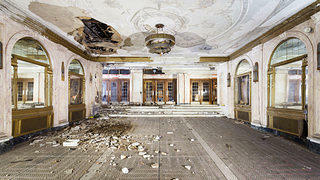 For Matt Lambros, an abandoned movie theater—broken seats, decaying plasterwork, and all—is a happy place. So it’s no wonder he’s been seeking them out to photograph for almost a decade. Before his long-running moviehouse project culminated in two books, After the Final Curtain: The Fall of the American Movie Theater and Kings Theatre: The Rise, Fall and Rebirth of Brooklyn’s Wonder Theatre, he had been touring the Northeast shooting old mental health facilities, intrigued by the self-sufficient campuses and especially with the theaters each one had. Since then, he’s photographed over 100, featuring 24 in After the Final Curtain, which was released in late 2016. 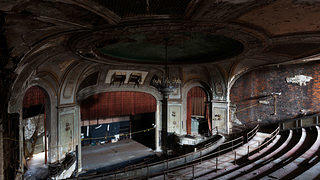 Loew's Poli Theatre in Bridgeport, Connecticut, was designed by the prolific theater architect Thomas W. Lamb and opened in 1922. The CIty of Bridgeport hopes to eventually restore it. The entranceway of the Loew's Poli Theatre. Newark's Paramount Theatre originally opened for vaudeville acts in 1886 and was expanded with Lamb's help in in the 20th century. 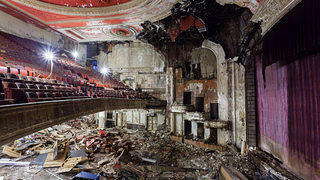 Uptown Theatre in Philadelphia first opened in 1929. Now, the Uptown Entertainment and Development Corporation is in the midst of a long-term effort to restore the Art Deco movie palace. The Brooklyn-based photographer traces his interest in abandoned buildings back to his childhood, when his grandmother would take him and his brother hiking in the woods, often in search of run-down barns to explore. He knew little about the history of American cinema and movie theaters before, but he’s an expert by now. 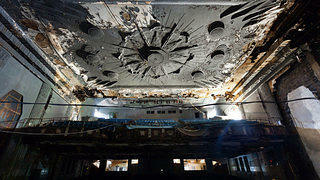 When he shoots an abandoned theater, it’s just one part of an intensive research process. He finds out when it first opened, what it first showed, how many it seated, and what’s become of it since. Like Fox Theatre in Inglewood, California, which opened in 1949 with Mr. Belvedere Goes to College. Shirley Temple, the film’s star, was even in attendance. It was the last theater built by 20th Century Fox before the Supreme Court ruled that studios could no longer own theaters and completely control the rights to the films played. Ultimately, it closed in 1988 and a preservation group has formed around it, with the building currently up for sale. 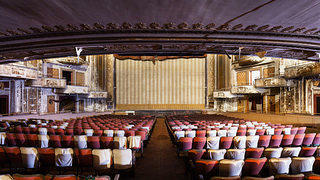 Opened in 1929, Inglewood, California's Fox Theatre opened with "Mr. Belvedere Goes to College." It's been closed since 1988. 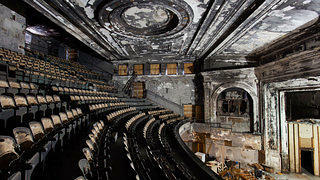 The auditorium of the Kings Theatre. 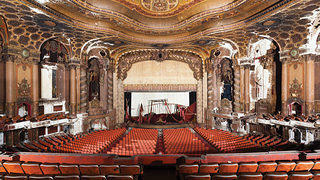 Lambros can even identify the work of some “palace theater” architects, like the prolific Thomas W. Lamb, by sight. He can tell you if certain moldings were from catalogues or custom-made. But preservation has also become a passion of the photographer’s. 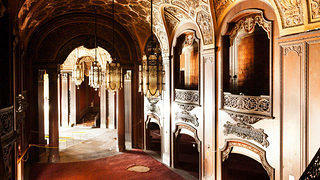 The Kings Theatre in Brooklyn, the first he shot as part of the project, is one of its shining success stories. It opened in 1929 in the Flatbush neighborhood. But falling sales eventually led to its closing in 1977. The City of New York partnered with ACE Theatrical Group of Houston to restore the movie palace in 2010, and by 2015 it was open again as a performing arts center, and the neighborhood around it has since seen new investment. “Personally I think that they’re beautiful,” Lambros says. “That’s not a value that necessarily merits them being preserved, but I think that a good anchor theater in a downtown really revitalizes the neighborhood, and there’s a lot of proof of that." 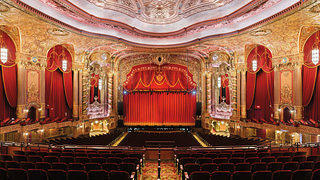 Loew's Canal Theatre was the second largest movie theater in New York City when it opened in 1927. Dorchester, Massachusetts' Franklin Park Theatre was designed by the Funk and Wilcox architecture firm and opened in 1914. 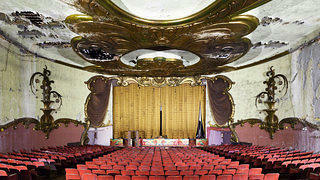 The Embassy Theatre in Port Chester, New York, dates back to 1926. For many of these abandoned buildings, though, the battle to save them is all uphill. Just getting inside safely enough to shoot can be a challenge. (Lambros admits that when he started the project he did a fair amount of trespassing.) And the size and scope of the damage often requires a great deal of funding, which can make it impractical for a small town in the absence of outside help. If his photographs can help drive interest in the buildings, he’s happy to help. But he says he recognizes that in many instances they'll simply be some of the last surviving images.